If you need help in finding competitive airfare, we offer a customized air booking service. We have wholesale contracts and can secure discounted airfare most of the time. To the right, you can see the difference our Consolidated Airfare can make! On the left is our discounted tour fare and to the right is the lowest published airfare to the general public. We charge a $50 non-refundable service fee per person to book your airfare. Even if booked through us, please note your airline ticket constitutes a contract between yourself and the airline (and not Teeming River Cruises). No itinerary will be booked until you have had a chance to review and approve. (Airfare rates change constantly.) After submitting this form, you will receive an email notification. Airfare changes by the hour sometimes. In order to book your itinerary, we need you to be available with your credit card, passports and on the phone with us. We are not able to put flights on hold. We will need to have a copy of your passport prior to booking your airfare. Once you approve the airfare itinerary (via email) and airfare is booked, all changes must be handled ONLINE or through the app directly with the airline per their Contract of Carriage. You will need to sign up for an account directly with the carrier using your email address. We recommend downloading their app on your smartphone. All future communication after booking regarding your airfare and changes must be handled directly with the carrier online. Note that these discounted fares usually CANNOT be upgraded once purchased (most can be for the Extra Space seat category). Your best chance for an upgrade is to try when you check in online or at the airport. If you want Business Class you need to have us book Business Class. Your smartphone is the best way to manage, choose seats, change seats, check-in, get boarding passes, add your Frequent Flyer account, add your TSA or Global Entry information and handle your air travel. Here is a quick summary of handling changes. (Our Cruise Director nor Teeming River Cruise reservationists can help to change your flights, even if purchased through Teeming River Cruises. Our low contract fares only allow changes to be made on the airline’s website or with the airline’s Smartphone app. Go to the airline’s website. Click on the log-in link or an area for schedules and checking in. Even if you booked your flight through a third-party website, such as Expedia, or travel agent, you should make changes at the airline’s website. Retrieve your reservation. Enter your confirmation, e-ticket, credit card number or mileage rewards number (if applicable) into the airline’s website. This will bring up your itinerary. Make the changes necessary to your flight. You will need to know your confirmation, reservation or electronic ticket number to do this. Enter this number in the appropriate field on the airline’s website — there will be a link to “schedules” or “itineraries” and check-in on the site. This will bring your flight information and itinerary up on your computer. Most sites ask you to click on the flight number and then ask you if you want to change the flight. This will bring up options to do so. Try to change the flight rather than canceling it, even if you are changing the entire thing. Sometimes you can avoid fees by changing your flight rather than canceling and rebooking. Search for new flights and add them to your itinerary. There might be fees or taxes associated with the change that you’ll need to pay online. Compare the cost of changing your itinerary to that of buying a completely new ticket. Sometimes this is the cheapest option. TIP Purchase travel insurance. Travel insurance will guarantee that you get your money back should your flight be canceled or you have to cancel due to illness or other circumstances. Teeming River Cruises is not liable and assume no responsibility or accept claims with regard to seat assignments, name changes, schedule changes, flight changes, cancellations, claims for refund or reimbursement of airline ticket fees, or any other loss or expense incurred by you for any reason whatsoever (including without limitation to bankruptcy, insolvency, reorganization of a carrier or similar relief from creditors) when purchasing or using the carrier’s services. The flight booking service offered by Teeming River Cruises can only be used in conjunction with a Teeming River Cruises trip. E-Tickets must be secured directly from the airline. If we make airline reservations for you, or contracted low rates do not allow Teeming River Cruises to choose or manage seat assignments. Not all airlines offer pre-assigned seats and some may impose additional charges for pre-assigned seats. Any additional charge imposed by any airline will be at your sole expense. Seating is solely under the control of the airline, as are the itinerary changes resulting from flight delays and schedule changes. We are not responsible for seat assignment changes made by the airline. Frequent flyer programs are private agreements between airlines and passengers, and we cannot be held responsible for mileage discrepancies involving airline loyalty reward programs. Some governments charge departure taxes and/or fees. These fees are the responsibility of each passenger traveling to the designated country and are not included unless stated. Flight cancellations, delays and schedule changes are the sole responsibility of the airline. Any additional charge imposed by any airline will be at your sole expense. Itinerary changes resulting from flight delays and schedule changes are the sole responsibility of the airline and Teeming River Cruises accepts no responsibility or liability for such delays or rescheduling. No refunds will be provided by Teeming River Cruises for portions of trips missed due to canceled, rescheduled, or delayed flights after airport check-in, nor is Teeming River Cruises responsible for any additional expenses you may incur prior to joining your trip if you miss your departure flight or flight connection. If you miss your departure flight or connection, it is your responsibility to work with the airline on which you are ticketed to reach your destination. All airfares quoted at the time of your booking will be based on roundtrip purchase and will include air-related taxes, fees and fuel surcharges imposed by the airlines. Any additional fees charged by the airlines such as checked baggage fees, seat selections and/or any other services are your sole responsibility. Flight itineraries provided are subject to change by the Air Carrier(s). Airlines require your name to appear on your airline ticket exactly as it appears on your passport. We shall not be responsible or liable for consequences of a name on an airline reservation and passport not matching exactly. We shall not be responsible or liable for costs resulting from airline schedule changes, lost air ticket, delay, disruption or canceled flights; lost baggage or missed connections. TSA regulations require us to collect the full first, middle and last name as it appears on your passport or government-issued ID, as well as the date of birth and gender. This information is required before we can book your air. 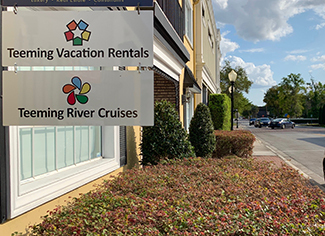 Teeming River Cruises is not responsible for denied boarding or reissue costs due to an incorrect name, date of birth, or gender information supplied to Teeming River Cruises.